Click on the image below to open and enlarge, after opening click again to 2 x enlarge and then scroll with your mouse’s thumb wheel while holding your “Ctrl” key in order to magnify the image larger or smaller, use your browser’s back arrow to return to this webpage. Please confirm the Preliminary Layout meets with your satisfaction or use the FORM at the bottom of this page to indicate your desired corrections. 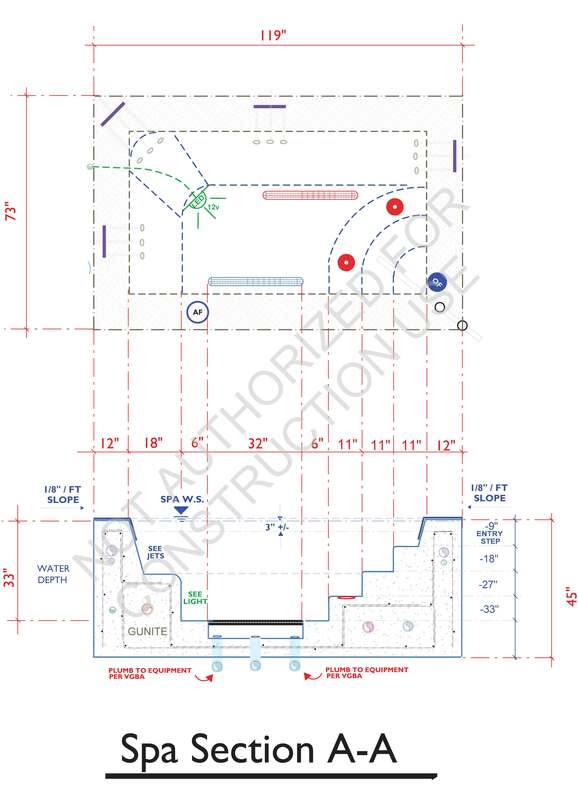 This P-1.1 PRELIMINARY SPA LAYOUT SECTION A*A and B-B REV-1 Layout provides you with a layout sheet that can be printed, marked up with the information being requested and emailed returned completed. You can then upload a jpf.file (photo image) that addresses any necessary corrections and provide us with further information that can help to aid our understanding for your backyard development ideas. IF YOU CAN PROVIDE A ROUGH SKETCH OF YOUR IDEAS, TOGETHER WITH THE BASIC DIMENSIONS OF THE LAYOUT, THIS SHALL AID THE PROCESS FOR GETTING OUR MIND AROUND YOUR DESIRED CONCEPT. PLEASE PROVIDE US WITH AN OFFICIAL PROPERTY PLOT PLAN THAT IS SHOWING ALL PROPERTY LINE DIMENSIONS. WE CAN PROVIDE TWO DIFFERENT LEVELS OF DESIGN SERVICE. AS EXPLAINED ON THE PAGE ABOVE THIS WILL INVOLVE MORE OR LESS PLANNING SHEETS. PLEASE SELECT THE LEVEL THAT BEST SUITS YOUR DESIRES FOR INFORMATION. MOST BUILDING DEPT. 'S SHALL REQUIRE STRUCTURAL ENGINEERING, AS ONE OF THE PREREQUISITES FOR OBTAINING A PERMIT TO BUILD. IF A PROJECT HAS UNIQUE FEATURES (WATERFALL, SITE RETAINING WALLS, ETC.) THEN THE STANDARD "BOILER PLATE" WOULD NOT SUFFICE AND A "SITE SPECIFIC" WOULD NEED TO BE PROVIDED IN ORDER TO ADDRESS THE CONSTRUCTION APPROACH FOR ANY SPECIALITY FEATURES. PROVIDE THE DESIRED MEASUREMENTS FOR THE LENGTH & WIDTH OF THE POOL. STRUCTURAL ENGINEERING CAN INVOLVE A STANDARD APPROACH TO THE EXISTING CONDITIONS WHICH ANTICIPATES NORMAL OR EXPANSIVE LOAD VALUES FOR THE IMPOSING SOIL PRESSURES. IF THE EXISTING CONDITIONS AND OR OTHER CONSIDERATIONS FALL OUTSIDE THIS CRITERIA FOR THESE STANDARDS, THEN "SITE SPECIFIC" STRUCTURAL ENGINEERING CONSIDERATIONS MUST EVALUATE THE UNIQUENESS OF THE SITE'S GEOTECHNICAL CONDITIONS AND CONSIDER A STRUCTURAL REMEDY THAT CAN ACCOMMODATE THE DESIGN. IF A "SITE SPECIFIC" APPROACH BECOMES NECESSARY, THEN THE SUBMISSION OF A "PLOT PLAN" MUST BE ACCOMPANIED WITH A CURRENT SOILS REPORT (CERTIFIED WITHIN PAST 2-YEARS). PROVIDE THE DESIRED MEASUREMENTS FOR THE SHALLOW AND DEEP END OF THE POOL. IF YOU DESIRE A SHALLOW AREA THAT IS REFEREED TO AS A "CABO SHELF" AND OR "CARIBBEAN SHELF" SELECT THE DESIRED DEPTH ABOVE. ALSO, REMEMBER THAT THE DEPTH IS MEASURED FROM THE "FINISHED CONCRETE" DECK ELEVATION, NOT THE ACTUAL WATER DEPTH. THE DECK IS TYPICALLY +5 TO +6" ABOVE THE POOL WATER SURFACE. THUS A -18" DEPTH WOULD REPRESENT APPROXIMATELY -12" OF ACTUAL WATER DEPTH. IF YOU DESIRE A BENCH THAT IS REFEREED TO AS A "SWIM-OUT" SELECT THE DESIRED DEPTH THAT YOU WOULD LIKE TO SEE. REMEMBER THAT THE DEPTH IS MEASURED FROM THE "FINISHED CONCRETE" DECK ELEVATION, NOT THE ACTUAL WATER DEPTH. THE DECK IS TYPICALLY +5 TO +6" ABOVE THE POOL WATER SURFACE. THUS A -18" DEPTH WOULD REPRESENT APPROXIMATELY -12" OF ACTUAL WATER DEPTH. A TYPICAL BENCH WOULD BE APPROXIMATELY 6'-0" LONG. THESE CAN BE PLACED UNDER A WATERFALL AND ACT AS A SEAT, AS WELL THEY CAN ACT AS AN ENTRY OR EGRESS POINT FOR GETTING IN AND OUT OF THE POOL'S ENVIRONMENT. 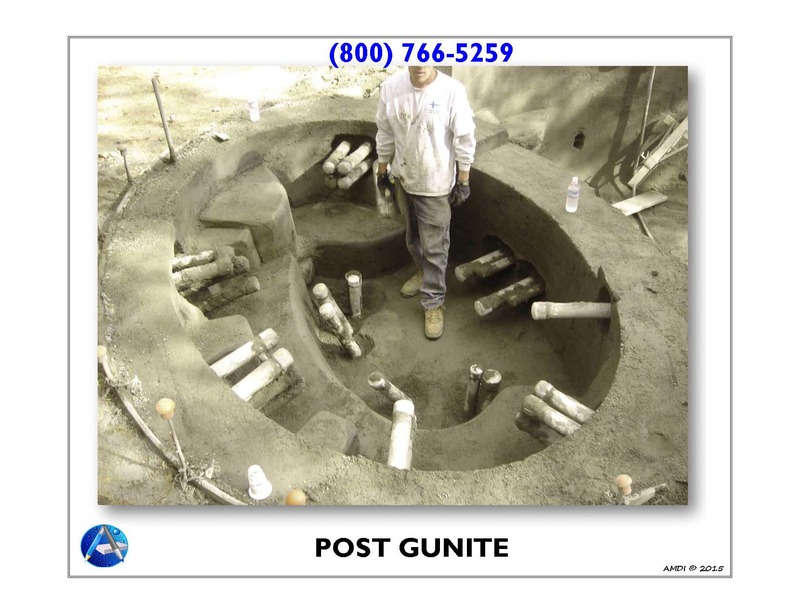 IN-GROUND SPAS CAN TAKE VIRTUALLY ANY SHAPE AND STARTING WITH A SHAPE CAN HELP US TO BETTER ENVISION WHAT YOU ARE GRAVITATING TOWARD. FROM THE SHAPE WE CAN PROPORTIONALITY DIMENSION THE SPA IN RELATION TO THE POOL AND YARD SPACE THAT IS AVAILABLE. AS WELL, THE NUMBER OF SEATING POSITIONS BEING DESIRED SHALL DICTATE THE SPA'S SIZE AND SHAPE. 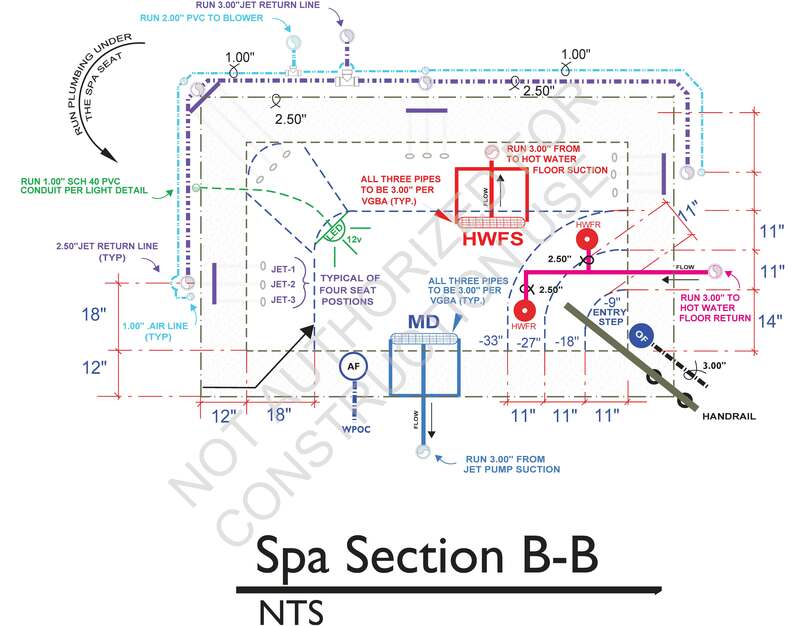 IN CALLING OUT THE SPA'S DIMENSIONS, TAKE A PAD AND PEN AND SKETCH A SELECTED SHAPE AND THEN USE A MINIMUM SPACING DISTANCE BETWEEN EACH SEAT OF 3'-0". THIS OF COURSE IS THE MINIMUM AND IF YOU'LL HAVE LARGER ADULTS GENERALLY USING THE SPA, THEN YOU'LL NEED TO ACCOMMODATE A WIDER SEATING AREA. FROM THIS RESULT YOU'LL BE ABLE TO BETTER IMAGINE THE SPA'S USAGE AND CAPACITY. ALSO REMEMBER THAT LARGE SPA'S HOLD MORE WATER AND SHALL REQUIRE MORE TIME TO BRING UP TO THE HEATED TEMP. DEPENDING UPON THE TORSO MEASUREMENT (FROM BASE OF SPINE TO BOTTOM OF CHIN), THE DESIGNATED DEPTH OF THE SPA'S SEAT CAN BE DETERMINED. SEATING CAN BE VARIED AND GENERALLY WILL RANGE BETWEEN -18" TO -20" OF WATER DEPTH, YOU'D BE ADDING +5" TO 6" TO THIS MEASUREMENT IN USE THE COMMON REFERENCING FROM DECK HEIGHT. THE SPA DEPTH IS REFERRING TO THE SPA'S VERY BOTTOM AND AGAIN...THE DEEPER THE SPA THE MORE WATER AND MORE TIME TO HEAT UP. 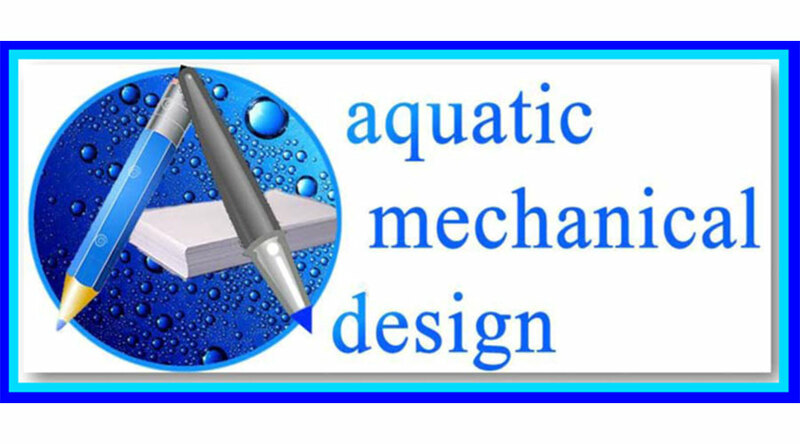 TYPICALLY, A 3'-0" (-36") WATER DEPTH IS IDEAL. THE DESIRED SEATING POSITIONS WILL DICTATE HOW MANY JETS WILL SUFFICE. THE NUMBER OF JETS PER SEATING POSITION, TIMES THE NUMBER OF SEATS WILL QUANTIFY THE TOTAL NUMBER OF JETS NECESSARY. IMAGINE YOU'RE ACTUALLY IN THE SEAT AND THINK ABOUT WHERE YOU WANT THE JET ACTION TO COME IN CONTACT WITH YOUR BODY. THESE THERAPEUTIC PRESSURE POINTS CAN ADD TO THE RELAXING AND SOOTHING COMBINATION FOR ENJOYMENT. THERE IS A MANIFOLD STYLE OF JET CONFORMITY THAT CAN POSITION 3-JETS ON THE BACK REST PORTION OF THE SPA'S SEATING POSITION. THESE CAN BE INSTALLED AS ONE ON THE LOWER BACK AND TWO ON THE UPPER OR REVERSED, AS TWO ON THE LOWER AND ONE ON THE UPPER. THIS CAN BE COMPLIMENTED WITH ANOTHER SINGLE JET POSITIONED BEHIND THE CALF OF THE LEG. THIS OVERALL JET CONFORMITY WOULD THEN REQUIRE FOUR JETS PER SEATING POSITION. THE MAXIMUM NUMBER OF JETS PER 3-HP BOOSTER PUMP IS +/- 12-EA. THUS FOUR JETS TIMES 3-SEATS WOULD EQUAL THE 12-EA MAXIMUM FOR A SINGLE BOOSTER PUMP (SEE MORE ABOUT HP / JET NOZZLES BELOW). IF MORE JETS OR SEATING POSITIONS ARE DESIRED THEN ANOTHER BOOSTER PUMP MAY BE REQUIRED. IN-GROUND SPAS CAN RANGE FROM A TUB OF HOT WATER TO A HYDROTHERAPY LEVEL OF JET ACTION THAT WILL SOOTH AND RELAX A CONDITIONED ATHLETIC BODY. ON A 1 TO 10 SCORING, SELECT THE LEVEL OF SOPHISTICATION EXPECTED BY THE RESULTS OF BUILDING AN IN-GROUND SPA. THE REFERENCE TO "AIR" ABOVE IS REFERRING TO A DEVICE CALLED AN "AIR BLOWER" AND DEPENDING UPON THE SELECTED NUMBER OF JETS, IT MAY REQUIRE UTILIZING A DUAL PUMPING AND A DUAL AIR BLOWER SYSTEM. FOR SOME FOLKS, THE JETS ARE NOT REALLY IMPORTANT, AS THEY JUST WANT TO RELAX IN THE HOT WATER ENVIRONMENT. IF THIS IS THE CASE THEN A BOOSTER PUMP MAY NOT BE NECESSARY AND THE SPA'S FILTRATION PUMP WOULD AID THE JET'S FUNCTION. THIS WOULD GENERALLY ALLOW UP TO SIX SINGLE JETS (ONE PER SEATING POSITION) TO BE OPERATIONAL WHILE FILTERING / HEATING THE SPA. THIS IS A SIMPLER WAY TO BUILD A SPA. THE DOWN SIDE IS THAT IT TAKES LONGER TO HEAT THE SPA UP BECAUSE THE SPA JETS ARE A VENTURI TYPE JET THAT ALSO INDUCES AIR. COLDER AIR BEING MIXED WITH WATER BEING WARMED UP COOLS THE WATER DOWN AS IT PASSES THROUGH THE JET, THUS TAKING LONGER TO HEAT THE WATER. THIS IS ONE OF THE MAIN REASONS THAT MANY LESS SOPHISTICATED APPROACHES TO BUILDING IN-GROUND SPAS RESULTS IN TAKING TOO LONG TO HEAT UP. AN AIR BLOWER IS AN OPTION AND IF A BOOSTER PUMP ISN'T UTILIZED THEN AN AIR BLOWER'S CONTRIBUTIONS ARE SOMEWHAT NEGATED. WHEN INSTALLED IN COMBINATION WITH A BOOSTER PUMP THE AIR BLOWER ACTS AS A SEPARATE THERAPEUTIC POSSIBILITY AND CAN BE ACTIVATED AS AN AUTOMATED RELAY FUNCTION FOR THE SPA'S EXTENDED OPERATIONAL ENJOYMENT. THE WAY THE AIR BLOWER WORKS UNDER THIS SPECIFICATION IS THAT WHEN THE VENTURI STYLE JET'S FORCED WATER IS PASSING THRU THE JET THE BLOWER PROVIDES A HIGHER CUBIC FOOT PER MINUTE (CFM) AIR VOLUME THAN WHAT WOULD OTHERWISE BE AVAILABLE UNDER JUST THE NORMAL INDUCTION PERFORMANCE OF THE VENTURI EFFECTS. THEREFORE, THERE IS MORE AIR AVAILABLE AT THE JET'S VENTURI ORIFICE PROVIDING FOR BETTER AIR / JET ACTION "BUBBLES". THESE BUBBLES TOGETHER WITH THE WATER STREAM PROVIDE A PULSATING EFFECT THAT MIMICS A MESSAGE FOR APPLY A VARIATION IN RESPONDING PRESSURE BEING APPLIED TO THE BODY. WHEN HEATING A POOL OR SPA IT IS 67% MORE EFFICIENT TO DELIVER THE HEATED WATER TO THE BOTTOM OF THE WATER'S ENVIRONMENT. THIS IS SUBSTANTIATED IN THE SCIENCE OF HYDRONICS AND SOME OF THE OLDEST EXAMPLES OF THIS ARE STEAM AND HOT WATER RADIATORS. IN PROVIDING A PLUMBING DESIGN THAT TAKES ADVANTAGE OF THIS, THE WATER WILL HEAT UP FASTER AND MORE EFFICIENTLY. HOT WATER RETURNS ARE GENERALLY CONNECTED TO AN AUTOMATED FUNCTION FEATURE THAT CAN ACTIVATE THIS MODE OF OPERATION WHEN IT IS BEING DESIRED. LIGHTING IS VERY IMPORTANT FOR EXTENDING THE HOURS OF OPERATIONAL ENJOYMENT OF THE POOL'S ENVIRONMENT. BESIDES SAFETY DURING NIGHT-TIME USE, TAKING ADVANTAGE OF COLORED LIGHTING CAN HEIGHTEN THE VISUAL EFFECTS WHILE HIGHLIGHTING THE ASCETIC ATTRIBUTES OF A BACKYARD'S LIVING SPACE. A POOL / SPA ISN'T JUST FOR SWIMMING, IT CAN ALSO PROVIDE THE VISUAL APPEAL DURING OFF-SEASON. THE NUMBER OF LIGHTS NECESSARY WILL HAVE TO DO WITH THE SIZE OF THE POOL / SPA AND THE TYPE OF LIGHT SELECTED. THE LATEST STYLE OF LIGHT (GLO-BRITE 12v) HAS A SMALLER FACE AND NO LONGER REQUIRES THE LARGE CANISTER NICHE TO BE INSTALLED, THEREFORE MAKING THEM LESS EXPENSIVE PER LIGHT TO INSTALL. AS A LOW VOLTAGE LIGHT THESE ARE INCREDIBLY ENERGY EFFICIENT AND QUITE BRIGHT (190-WATT EQUIVALENCE) FOR THE AMOUNT OF POWER BEING USED. ALTHOUGH MORE LIGHTS MAY BE USED, THE BENEFIT IS THAT THE LIGHT DISTRIBUTION CAN BE BETTER PIN POINTED TO ACHIEVE A MORE COMPREHENSIVE RESULT FOR THE ILLUMINATING EFFECTS. THIS MEANS UNDER LIGHTING WATERFALLS FROM BENCHES, PROVIDING LIGHTS AT THE ENTRY STEPS AND OTHER POINTS OF ENTRY, AS WELL AS DESIGNATING A FIXED COLOR (WHITE, BLUE, MAGENTA, GREEN) AND OR CHANGING COLORS THROUGH THE AUTOMATION SYSTEM'S PROGRAMMABLE CONTROL FUNCTION FEATURES. A TYPICAL SPA WOULD UTILIZE A SINGLE LIGHT. IF THE SPA IS A UNIQUE SHAPE AND OR LARGER YOU MAY WISH TO CONSIDER ADDITIONAL LIGHTING. SURFACE SKIMMERS ARE FOR THE PURPOSE OF DRAWING FLOATING DEBRIS INTO THE THROAT OF THE SKIMMER DEVICE AND DEPOSITING THIS DEBRIS INTO A BASKET THAT REST INSIDE THE SKIMMER'S CANISTER. WHEN THESE ARE POSITIONED IN A MANNER THAT TAKES ADVANTAGE OF THE "RETURN LINES" COUNTER-ROTATION DIRECTIONAL ADJUSTED INLETS, THEN IT SHALL GREATLY REDUCE THE AMOUNT OF DEBRIS THAT ENDS UP ON THE BOTTOM OF THE POOL / SPA. THE DESIGN OF ANY POOL / SPA SHOULD INVOLVE CONSIDERATIONS FOR THE EASE OF MAINTENANCE OPERATIONS AND THE PLACEMENTS OF THIS SUCTION SIDE DEVICE IS AN IMPORTANT PART OF THOSE CONSIDERATIONS. GENERALLY SPEAKING A SKIMMER RATIO WOULD BE 1-SKIMMER PER EVERY 500-SF OF POOL SURFACE AREA. WATER FEATURES COME IN ALL SHAPES AND SIZES BUT BEGINNING WITH A DIMENSIONAL RELEVANCE CAN HELP TO START THE PROCESS AND DEFINING THE ATRIBUTES. DEPENDING UPON THE TYPE, STYLE AND SIZE OF A WATER FEATURE, THE QUANTITY OF LIGHTS CAN VARY. WHEN ENVISIONING HOW YOU'D LIKE TO ILLUMINATE THE FEATURE WILL HELP TO QUANTIFY THE AMOUNT OF LIGHTS THAT MAY BE NECESSARY. LIGHTS SHOULD GENERALLY BE PLACED SO THAT THEY SHINE AWAY FROM THE HOME OR VIEWING LOCATION'S VANTAGE POINT IN A FASHION THAT PLACES THE LIGHT IN A LOCATION THAT CAN ESCAPE SEEING THE ACTUAL LIGHTING FIXTURE. IN SELECTING A FILTER, IT IS IMPORTANT TO CONSIDER WHAT COSTS MORE TO MAINTAIN. CARTRIDGES MUST BE REPLACED EVERY 18 TO 24 MONTHS (ACCORDING TO THE MFG. 'S RECOMMENDATIONS) AND REPLACEMENTS SHALL RUN $400 TO $600 FOR EVERY TIME YOU REPLACE THEM. ADDITIONALLY, CARTRIDGE AND D.E. FILTERS WILL FILTER DOWN TO 5 MICRON AT CLEAN STAGE AND 2-3 MICRON AT DIRTY STAGE. THIS LEVEL OF FILTRATION IS TRULY OVER FILTRATION FOR A SWIMMING POOL AND ADDS TO THE OVERALL TDH RESTRICTION FOR THE SYSTEM (RESTRICTION = LOST ENERGY), MAKING PUMPS WORK HARDER AND LESS EFFICIENT. FURTHER MORE, THE HUMAN EYE CANNOT DISTINGUISH A PARTICLE SIZE SUSPENDED IN WATER BELOW 40 MICRONS. REALIZE THAT SAND FILTRATION AT CLEAN STAGE STARTS AT 20 MICRON AND GETS TO 10 MICRONS AT THE DIRTY STAGE, THAT'S FOUR TIMES SMALLER THAN THE NAKED HUMAN CAN SEE! WHEN TALKING TO YOUR SOLICITED PLUMBERS SEE IF THEY UNDERSTAND THIS CONCEPT AND CHOOSE A PERFORMER WHO DOES. THE INTELLIFLO VARIABLE FLOW (VSF) PUMP PROVIDES PRECISE FLOW CONTROL, WHICH MEANS INCREASED EFFICIENCY, SAVINGS AND PERFORMANCE. THE PUMP’S INNOVATIVE DUAL-TECHNOLOGY DESIGN ENSURES THE DESIRED FLOW RATE IS MAINTAINED, NO MATTER THE CONDITIONS. PLUS, THE INTELLIFLO VSF PUMP HELPS THE REST OF YOUR EQUIPMENT PERFORM EXACTLY AS IT’S MEANT TO—FROM FILTERS TO LAMINARS TO WATERFALLS. THE INTELLIFLO VSF VARIABLE SPEED AND FLOW PUMP IS JUST ANOTHER IN A LONG LINE OF INNOVATIVE PRODUCTS FROM PENTAIR. CLASSIC WHITE STANDARD WHITE PLASTER IS THE TRIED AND TRUE POOL AND SPA SURFACE FINISH. WHITE PLASTER HAS BEEN AROUND AS LONG AS PEOPLE HAVE BEEN BUILDING SWIMMING POOLS AND IT REMAINS A POPULAR CHOICE IN SPITE OF THE MYRIAD OF CHOICES THAT HAVE COME INTO THE MARKET IN RECENT YEARS. ITS SIMPLE COMBINATION OF WHITE CEMENT, WHITE MARBLE AGGREGATE AND WATER MAKE FOR AN ECONOMICAL CHOICE THAT WILL GIVE YOU THAT CLASSIC SWIMMING POOL LOOK. AGGREGATE EFFECTS – COLORED CERAMIC QUARTZ ANOTHER HIGHLY INNOVATIVE ADDITION TO THE PALETTE OF SURFACE OPTIONS HAS BEEN THE USE OF SPECIAL COLORED CERAMIC AGGREGATE PRODUCTS. THESE AGGREGATES ARE BASICALLY A VERY SPECIALIZED FORM OF CERAMIC-COATED SAND THAT COMES IN A VARIETY OF PRE-MIXED PLASTER PRODUCTS. THE EXPOSED AGGREGATE REVOLUTION PERHAPS THE ULTIMATE ANSWER TO ALL POOL SURFACE CONCERNS COMES IN THE FORM OF PEBBLE SURFACES. PEBBLE SURFACES CONSIST OF SMALL, SMOOTH RIVER PEBBLES EMBEDDED THROUGHOUT THE PRODUCT. OVER THE PAST DECADE, PEBBLE SURFACES HAVE INCREASED DRAMATICALLY IN POPULARITY AND COME IN A BROAD RANGE OF COLORS AND COLOR COMBINATIONS. INDICATE THE TYPE OF SURFACE THAT IS INTENDED TO SURROUND THE POOL / SPA. CONCRETE FLAT-WORK IS MEASURED BY SQUARE FEET OF A GIVEN AREA AND THEN TOTALED. SOME CONCRETE FLAT-WORK AREAS MAY NOT BE KNOWN AT THE BEGINNING OF THE DESIGN PROCESS, AS IT GENERALLY IS AN EXTENSION OF THE DESIGN ONLY AFTER A POOL / SPA HAS BEEN POSITIONED IN THE YARD SPACE. IF YOU HAVE AN APPROXIMATION OF SOME AREAS THAT ARE BEING CONSIDERED I.E. ; PATIO @ 10' x 10' = 100-SF, WALKWAY @ 3.5' x 50' = 175-SF, ETC.. THEN WE WILL BE ABLE TO APPLY THAT INFORMATION TO DEVELOPING A PLAN THAT MORE CLOSELY PARALLELS YOUR BACKYARD VISION. TELL US WHAT YOU CAN SO THAT WE MAY BECOME MORE AWARE OF YOUR PERSONAL DESIRES. AB ROCK IMPORT CAN BE USED TO PREPARE THE PAVING AREA'S SUB-GRADE. IN ORDER TO IDENTIFY ALL REQUIREMENTS PLEASE INDICATE HERE WHETHER OR NOT IT SHALL BE YOUR DESIRE TO INCLUDE THIS ELEMENT OF PREPARATION. SPOILS. IN MANY AREAS THE NATIVE SOIL HAS A HIGH CLAY PERCENTAGE OF ITS CONTENT. CLAY HAS EXPANSIVE CHARACTERISTICS AND THE MORE PERCENTAGE OF CLAY THAT A NATIVE SOIL CONTAINS, GENERALLY THE MORE IT CAN EXPAND. WHEN A HEAVY CLAY SUB-SOIL ABSORBS MOISTURE IT BEGINS TO SWELL. IF THAT SOIL TYPE IS UNDER CONCRETE FLAT-WORK AND IT SWELLS, WELL THEN IT CAN CAUSE A DECK TO BEGIN TO LIFT. MITIGATING THIS POTENTIAL IS OFF-SET WITH PREFORMING PER-SATURATION OF THE SUB-GRADE AND USING A CLASS II COMPACT-ABLE IMPORTED FILL MATERIAL SUCH AS AB-BASE ROCK. GENERALLY SPEAKING AND UNDER SUCH CONDITIONS, 4" TO 6" OF AB IS PLACED UNDER ALL DECKS AND A VIBRATORY COMPACTION PLATE IS USED TO PREPARE THE FLAT-WORK'S SUB-GRADE. KEEPING IN MIND THAT, IF AB IMPORT IS DESIRED, YOU WILL NEED TO ACCOUNT FOR THE REMOVAL OF 4" TO 6" OF NATIVE SOIL AND HAUL-OFF. THIS IS REFERRED TO AS THE REMOVAL OF SPOILS. A VIBRATORY COMPACTION PLATE CAN BE USED TO PREPARE THE PAVING AREA'S SUB-GRADE. IN ORDER TO IDENTIFY ALL REQUIREMENTS PLEASE INDICATE HERE WHETHER OR NOT IT SHALL BE YOUR DESIRE TO INCLUDE THIS ELEMENT OF PREPARATION. AB IS PLACED UNDER ALL DECKS AND A VIBRATORY COMPACTION PLATE IS USED TO PREPARE THE FLAT-WORK'S SUB-GRADE. KEEPING IN MIND THAT, IF AB IMPORT IS DESIRED, YOU WILL NEED TO ACCOUNT FOR THE REMOVAL OF 4" TO 6" OF NATIVE SOIL AND HAUL-OFF. THIS IS REFERRED TO AS THE REMOVAL OF SPOILS. OUR RECOMMENDATION IS TO USE #3 @ 18" x 18" O.C.B.W. THROUGHOUT ALL CONCRETE FLAT-WORK AREAS. EQUIPOTENTIAL BONDING CODE (NEC. 680) REQUIRES A MIN. OF 18" X 18" O.C.B.W. #3 STEEL REINFORCEMENTS TO BE PLACED IN A CONCRETE DECK FOR A MIN. OF 3'-0" AROUND THE ENTIRE SWIMMING POOL / SPA PERIMETER. OUR RECOMMENDATION IS TO USE #3 @ 18" x 18" O.C.B.W. THROUGHOUT ALL CONCRETE FLAT-WORK AREAS. THERE ARE MANY ATTAINABLE POSSIBILITIES IN SEEKING GREAT RESULTS BUT, GREAT RESULTS START WITH GREAT PLANNING. WE SUGGEST THAT YOU START BY CLEARLY DEFINING THE APPROACH, AND FROM THESE EFFORTS YOUR EXPECTATIONS SHALL BECOME ANCHORED IN A DESCRIPTIVE MEANING FOR HOW THAT REALITY WILL APPEAR. WITH CONCRETE FLAT-WORK, THIS BEGINS BY DEVELOPING AN EASY TO FOLLOW “SPECIFICATION”, THAT SHALL LIST MOST ALL OF THE CHOICES THAT WILL INVOLVE PROVING YOU WITH A DETAILED COST ESTIMATE RESPONSE FROM CONTENDING PERFORMERS. THIS QUESTIONER WAS DEVELOPED IN ORDER TO PROVIDE YOU WITH A TOOL. IN ENGAGING THIS FRAMEWORK YOU'LL BE PUTTING FORTH AN EFFORT TO ASSIST US IN COLLABORATING THAT INFORMATION INTO A REFINING AND DEFINING PRESCRIPTION FOR HOW 1ST CLASS RESULTS CAN BE ACHIEVED. THIS IS AN ADDITIVE THAT IS MIXED INTO THE READY MIX CONCRETE LOAD DESIGN AND PROVIDES A STRENGTHENING EFFECT TO THE CONCRETE ONCE IT HAS HAD TIME TO CURE. ADDITIONALLY, WHEN POURING A POURED IN-PLACE CANTILEVER SWIMMING POOL / SPA DECK EDGE, THIS ADDITIVE WILL HELP HOLD TOGETHER THE NEWLY PLACED CONCRETE READY MIX PRODUCT WHILE STILL IN IT'S PLASTIC / MOLD-ABLE STATE AND GIVE STRENGTH TO THE EDGE AFTER IT'S CURED. THE STANDARD LOAD DESIGN FOR READY MIX IS A 5-SACK LOAD / 2,500 PSI COMPRESSION LEVEL AFTER THE 28-DAYS CURE THRESHOLD. BY ADDING MORE CONCRETE PER CUBIC YARD TOGETHER WITH OTHER LOAD FACTORS, IT WILL PROVIDE ADDITIONAL COMPRESSION STRENGTH. COMPRESSION STRENGTH IS ONLY ONE COMPONENT FOR ACHIEVING A HEIGHTEN STRUCTURAL STRENGTH, WHEREAS STEEL REINFORCEMENTS, SUB-GRADE / GEOTECHNICAL CONDITIONS, ANTICIPATED TRAFFIC WEIGHT SHALL ALL NEED TO WEIGH-IN (NO PUN INTENDED) AND BECOME THE PRESCRIPTION FOR A SUSTAINABLE CONCRETE FLAT-WORK PRODUCT. THE SPECIFICATION FOR THE THICKNESS OF THE FLAT-WORK (SLAB ) IS DEFINED BY THE PURPOSE OF THE SLAB. AS AN EXAMPLE; A DRIVEWAY MAY BE REQUIRED TO BE THICKER (ESPECIALLY AT THE STREET APRON WHERE HEAVY TRUCKS CAN OFTEN USE IT AS A TURN-A-ROUND) DEPENDING UPON THE ANTICIPATED VEHICLE TRAFFIC AND VEHICLE WEIGHT A GREATER THICKNESS MAY BE REQUIRED. CONCRETE COLOR IS EITHER ADDED DURING THE READY MIX PRODUCTION PROCESS OR IT IS DUSTED ON DURING THE CONCRETE FINISHING PROCESS. THE DUST-ON COLOR GENERALLY HAS GREATER LONGEVITY IN RETAINING THE ORIGINAL COLOR VERSES THE IN-LOAD OR INTEGRAL PROCESS. INDICATE IF THERE IS A DESIRED HEIGHT FOR THE STEP RISER. THE MAX RISER HEIGHT PER CODE IS 7-5/8", ALSO INDICATE THE WIDTH OF THE STEP'S TREAD. THE MINIMUM TREAD PER CODE IS 11"
THE FACING OF THE STAIRS SHOULD BE IDENTIFIED AS TO YOUR DESIRES. THESE ARE SOME OF THOSE OPTIONS THAT CAN BE CALLED OUT ON PLAN. THERE ARE SEVERAL POOL / SPA EDGE SELECTION OPTIONS FROM WHICH TO CHOOSE AND BY IDENTIFYING YOUR DESIRES IT SHALL ALLOW YOUR PLANS TO PRESCRIBE THE SELECTION THAT SHALL MEET YOUR EXPECTATIONS. WHEN FORMING, PLACING AND POURING CONCRETE READY MIX AN "ECONOMY IN SCALE" CAN BENEFIT YOU DUE TO THE PERFORMERS GAINING FROM PRODUCTION EFFICIENCIES. THEREFORE, IF CONCRETE MOW-STRIPS, SEATING WALLS, STAIR CASES AND OR OTHER CONCRETE WORKS ARE BEING CONSIDERED, THEN NOTE THESE HERE FOR CONSIDERATION. Pool Construction Raised Bond Beam Sections "A"
THE TERM "BOND BEAM" REFERS TO THE TOP PORTION OF THE POOL / SPA'S SHELL, WHICH FOLLOWS THE COMPLETE PERIMETER. A "RAISED BOND BEAM" REFERS TO THE PORTION OF THE PERIMETER THAT HAS AN INCREASE IN HEIGHT. HEIGHT INCREASES WILL GENERALLY RISE BY INCREMENTS OF +6" AS A DIMENSION OF +6", +12", +18", +24" AND SO ON. EACH SECTION (A, B, C) WILL NEED A MEASUREMENT FOR THE LENGTH AND HEIGHT RELATIONSHIPS BEING DESIRED. PLEASE PROVIDE A ESTIMATED MEASUREMENT IF APPLICABLE. Pool Construction Raised Bond Beam Sections "B"
PLEASE PROVIDE A ESTIMATED MEASUREMENT IF APPLICABLE. Pool Construction Raised Bond Beam Sections "C"
"FROST PROOF" PORCELAIN TILE IS MOST OFTEN USED FOR SWIMMING POOLS. PRODUCT SELECTIONS RANGE IN COSTS BY GROUPINGS (A,B,C,D,E,..ETC.) TYPICALLY THE GROUP "A" IS THE LEAST EXPENSIVE AND THE PURCHASE PRICE SHALL GO UP FROM THERE. THE ACTUAL PRODUCT SELECTION CAN BE MADE ANY TIME PRIOR TO THE INSTALLATION BUT, IT IS IMPORTANT TO DEFINE THE TILE SIZE I.E. ; 1" x 1", 2" x 2", 3" x 3", 4" x 4", 6" x 6", ETC...AS THE POOL'S CONFORMITY MUST BE CONSTRUCTED IN ORDER TO MATCH THE SELECTED PRODUCT'S DIMENSIONAL SIZES THAT ARE AVAILABLE. GROUP "A" IS THE LEAST EXPENSIVE AND THE PURCHASE PRICE SHALL GO UP FROM THERE. THE ACTUAL PRODUCT SELECTION CAN BE MADE ANY TIME PRIOR TO THE INSTALLATION BUT, IT IS IMPORTANT TO DEFINE THE TILE SIZE I.E. ; 1" x 1", 2" x 2", 3" x 3", 4" x 4", 6" x 6", ETC...AS THE POOL'S CONFORMITY MUST BE CONSTRUCTED IN ORDER TO MATCH THE SELECTED PRODUCT'S DIMENSIONAL SIZES THAT ARE AVAILABLE. INDICATE ON YOUR ROUGH SKETCH WHERE THE MAIN ELECTRICAL PANEL IS LOCATED AND WHERE YOU WISH THE POOL EQUIPMENT'S SUB-PANEL TO BE LOCATED. PROVIDE AN ESTIMATED DISTANCE (WE WILL VERIFY AFTER THE DIMENSIONAL SITE PLAN HAS BEEN COMPLETED). THE DISTANCE TOGETHER WITH THE AMPERE LOAD DEMAND WILL DETERMINE WHAT THE WIRE AND CONDUIT SIZE WILL NEED TO BE BUT, ITS GOOD TO START WITH A ROUGH IDEA. THE VOLTAGE WILL MOST OFTEN BE 240v SINGLE PHASE AND THE AMPERE LOAD IS DETERMINED BY THE SELECTED OF THE EQUIPMENT AND EACH OF THE COMPONENT'S ENERGY DEMANDS. THE DISTANCE TOGETHER WITH THE AMPERE LOAD DEMAND WILL DETERMINE WHAT THE WIRE AND CONDUIT SIZE WILL NEED BE AND THIS ALL NEEDS TO FALL WITHIN THE "ALLOWABLE VOLTAGE LOSS", WHICH IS LESS THAN 3.0% WHEN UNDER FOLL LOAD. NO NEED TO FILL THIS IN JUST YET, WE'RE JUST MAKING YOU FAMILIAR WITH HOW THE PROCESS FOR DETERMINING THE CORRECT SIZES IS ACCOMPLISHED. SOME PROJECTS WISH TO DISTRIBUTE SECONDARY "YARD POWER" FOR OTHER USAGE I.E. ; BBQ'S, RECEPTACLES, FANS, LIGHTS, ETC.. THIS POWER USAGE SHALL ALSO NEED TO BE SIZED ACCORDINGLY. IF KNOWN YOU MAY PROVIDE US WITH A PRELIMINARY MEASUREMENT AND IDENTIFY THE PURPOSES. INDICATE WHAT TYPE OF GAS IS AVAILABLE, IF GAS IS TO BE DISTRIBUTED ON SITE. PROVIDE A PRELIMINARY DISTANCE FROM THE GAS METER OR TANK TO THE POOL EQUIPMENT PAD, IF KNOWN. THE FINAL VALUE WILL BE DETERMINED FROM THE DIMENSIONS ON THE SITE PLAN. PROVIDE A PRELIMINARY DISTANCE FROM THE GAS METER OR TANK TO THE OTHER USAGE IF KNOWN. ALSO IF YOU'VE SELECTED ANY SPECIFIC EQUIPMENT, PLEASE PROVIDE THE BTU RATING FOR EACH PIECE. THE FINAL VALUES WILL BE DETERMINED FROM THE DIMENSIONS ON THE SITE PLAN. IN THE CHANCE THAT YOU HAVE OTHER CONSIDERATIONS THAT WE HAVE FAILED TO IDENTIFY, PLEASE PROVIDE US WITH A DESCRIPTION FOR WHAT THESE MAY BE. PLEASE SELECT THE FORM OF PAYMENT YOU'D PREFER. REMEMBER CREDIT CARDS AND PAYPAL HAVE A TRANSACTION FEE THAT WILL BE PART OF THE COSTS WE CHARGE YOU. IN PRODUCING A DESIGN FOR OUR CLIENTS, WE MUST REMAIN COGNIZANT OF THEIR BUDGETARY EXPECTATIONS. IT DOES NEITHER OF US ANY GOOD TO END UP DESIGNING SOMETHING THAT TURNS OUT TO BE ECONOMICALLY INFEASIBLE, CORRECT? SO...JUST LIKE WHEN YOU'RE BUYING A HOUSE, THINK OF THE BACKYARD AS A PIECE OF A HOUSE AND YOU KNOW WHAT SIZE HOUSE IS AFFORDABLE. SO SET THE BUDGET AND LEAVE ABOUT +/-10% MORE FOR UPGRADE CONSIDERATIONS.